Last night I made mashed sweet potatoes to go with dinner. My daughter, Sarah, wasn’t a fan. I’ve tried sweet potatoes several ways and she never likes them. I saw that as a challenge – I was determined to find a way to make them that she would enjoy. Sarah loves pumpkin muffins, pumpkin pancakes, and pumpkin pie. Sweet potatoes have a sort of pumpkin-y aspect to them. 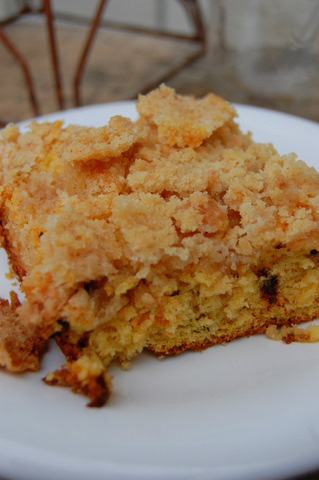 I decided to try a bread, then went for a coffee cake instead, because I was in the mood for the topping (to be honest, that is always the reason I made a coffee cake. Am I alone in that??). My family liked the coffee cake, although my husband said the bottom was too brown. Whatever, dork. Sarah loved it! Success! Mix dry ingredients. Mix wet ingredients. Combine the two, then spread into a greased square pan (8×8 or 9x). Cut butter into sugar, cinnamon, and flour to make topping. Keep cutting until the butter is well-combined into the mixture, then sprinkle over the top of the coffee cake batter. Use a knife to sort of cut swirls into the batter with the topping. Bake for 30-35 minutes in a 375 degree oven. (If your husband is picky about a “brown” bottom crust, then go for the 30).